Adelaide at South Terrace, but due to a change it times I decided to push through to Murray Bridge and stayed there for the night. The meeting didn’t start until 12 noon so in essence I had four hours to get from Murray Bridge to Mount Gambier – too easy ( HA!!) The problem is that the GPS told me one thing – like the distance and the time needed to get there, what it does not tell me is road conditions, small towns all along the way that require speed reductions, fuel stop, and I got there in time to grab a drink before the meeting began. This is the first time I have tried going via Murray Bridge and I found it stressful to worry about time whilst driving. I should spend time thinking about the meeting- not the time it’s taking me to drive there. You are probably thinking that I am going senile in that I have driven to Mount Gambier often enough in the last few years, I should know all these little places. Yes – that’s very true, but then I was driving to Mount Gambier and it wasn’t an issue – this time I was driving to a timetable and that was an issue because these places were causing me to slow down and that was taking up time. Anyway, that’s it for M.G until May of 2018. The next meeting will be in Adelaide in February. The Remembrance Service at the Memorial was quite different this year in that it was attended by over 200 Officer Cadets from the Defense Force Academy who are here to complete live exercises as the final set of exercises before they return to Canberra for their final exams. I was not at the service, but I was told all about it when I arrived back home. 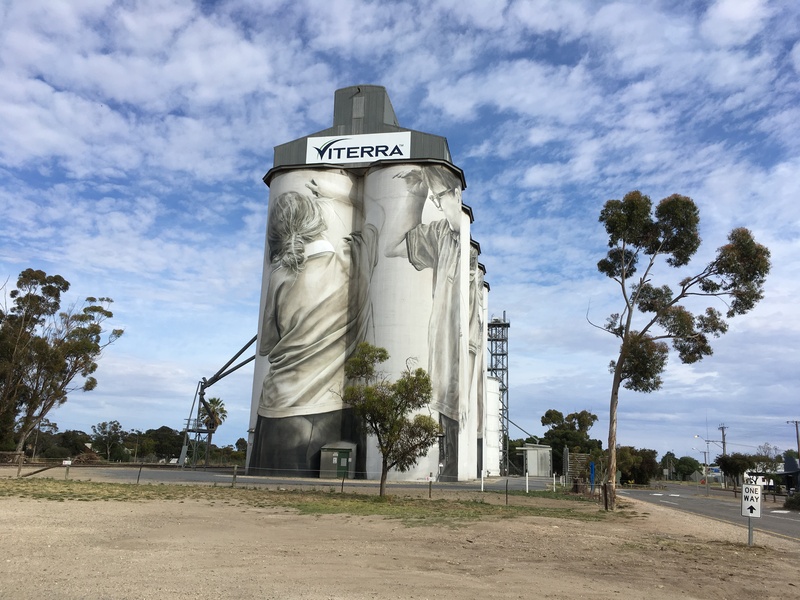 A number of farming towns have organised an artist to paint their grain silos. Coonalpyn was the first in South Australia and depicts the youth of the town. Other areas are taking this idea up but as far as I am aware it is not a cheap option and there’s not a lot of change from $85,000. Yogi has settled in back at home. I spoke to Jim and he tells me that Yogi was just a bit stressed. Odd because he’s been here a few times and he has always been fine. But he is getting older and that could be a factor, but he and Benji get on well together. Last time he was here, the WaWa was still with us, so perhaps he missed the WaWa. On the subject of the WaWa – never heard a word from Sooah after she and her husband left with the dog. Since I came back from Mount Gambier the weather has been cold, wet and windy – wind not so much, but definitely cold and wet. We had a good week of really nice warm weather but that’s well and truly gone for the time being. I know you can have an “Indian Summer” but can you have an “Indian Winter”? The Cadets are out and about and yesterday evening I was blocked from going on my walk with Benji and had to come back and go a different way – they were undertaking an exercise. I understand there was a “car explosion”and the “Army”was deployed to secure the area – not that we got to see much because the area was blocked off. This afternoon I have an appointment with my Cardiologist , so that should take a good part of the afternoon – drive to the hospital, have ECG, wait , wait, go, ten minutes with himself, leave, take Annabell to library. Quiet afternoon, really. Not that I could do much outside – too cold. Still summer and warm weather can’t be too far away. I don’t think he did – he was just a little unwell and missing his people. 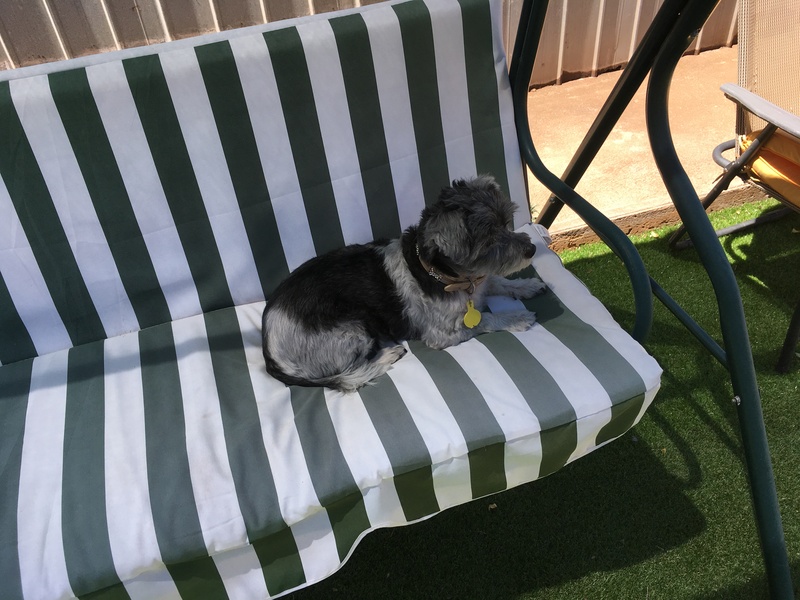 Benji sulks when I am away. I agree, I miss the WaWa from time to time, she was a funny little character – although Benji would not agree and he is happy she is gone. We didn’t hear from them the whole 17 months we looked after the dog. When she finally called me on my mobile to tell me they were coming round to see us, I didn’t even know they were back in Australia, let alone in town. They came, took the WaWa, departed. And that’s it. They are very lovely people and we wish them well in their new home in a new State, but it would have been nice to hear how the dog is from time to time. Even odder! Some gratitude might have been nice. It’s not been too cold but it has been very wet. Bucketing down for the last two days. Thank you for your visit and comment.